DART Police, Fare Enforcement Officers and transit employees will be at various DART locations Wednesday, March 7, from 7-9 a.m. during a system-wide Security Blitz to promote the new DART Say Something Safety and Security App as the easiest, most discreet way to report safety concerns directly to DART Police. DART Police work to make transit safer with additional security officers and cameras on platforms, buses, trains. But, they can’t do it alone. If you see something suspicious on a bus or train they want your help. During the blitz, you can expect information and promotional items to encourage you to downloading the app, which is free from the Apple App Store or Google Play. 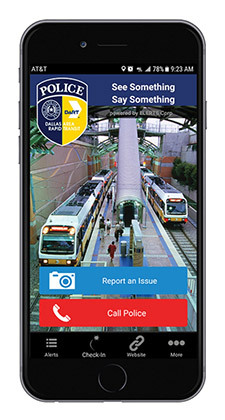 The DART Say Something app allows you to send text, photos and videos to report suspicious activity. The app also provides safety alerts from DART Police, allows you to share your location on a map and indicate whether you need help. It also works with the DART mobile website where you can access other information. For more information about the DART Say Something Safety and Security App, visit www.DART.org/DARTSaySomething or call DART Customer Information at 214-979-1111.